A Hands-on Guide to Creative Lighting is the latest in Nikon School educational DVDs. It’s mainly designed to show off the versatility of the Nikon Creative Lighting System (CLS), but also offers a lot of useful information about light and lighting for photographers of all skill levels. Before the DVD goes into flash photography, host and National Geographic photographer Bob Krist starts with the basics of light: direction, color, and quality. This may seem rudimentary for some, but these concepts are applicable to any type of photography and very important in understanding flash photography. Krist then explains some of the benefits of using flash and how it differs from using available light. He does an excellent job of explaining some of the more technical aspects of flash photography, such as sync-speed, with animations to illustrate the point. Once you have down some of the basic concepts, the DVD starts getting hands-on with some basic portrait setups using speedlights. The demos work one light at a time with Krist explaining the rationale behind light positions, additional lights, and how to overcome problems as they arise. You’ll see a three light setup and understand how to balance flash and ambient light using slow-sync and gels. There is even a brief demo of the R1 and R1-C1 close-up set. The best part of these demos is being able to see each shot as changes are made and the excellent diagrams to see the overall setup. The first half of the DVD features helpful diagrams as lights are added or moved to help understand the setup. Once you’ve seen how easy it is to work with the CLS, you get an overview of how to set up the various components of the system in master and remote modes. Every aspect is covered from the speedlights to using certain cameras’ built-in flashes as a commander. You even get to see Bob Krist’s personal location kit, all of which fits nicely in a carry-on size Storm Case. Just like Bob Krist did in the studio, McNally works in pieces when setting up for his shots. You get a clear explanation of why additional lights or diffusers are being added and get to see the results instantly. He also identifies problems as they arise and shows how to overcome them. Watching McNally connect and communicate with his subjects is a treat, and you can clearly see that connection translate into his pictures. Joe McNally utilizes the Nikon CLS in inventive ways. In what ends up being the DVD cover, McNally uses an SB-900 outside of a window with a CTO gel to simulate a warm sunset despite it being a rainy, overcast day. Joe McNally and Bob Krist make it a point of getting the light off the camera throughout the three on-location shoots. 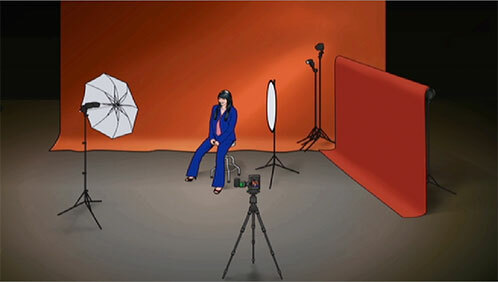 You see a lot of inventive uses of umbrellas, diffusers, reflectors, and gels. There’s a lot of great advice on filling in shadows and maintaining a balance between flash and natural light to make it look as if no flash was used at all. There are great examples of both slow and high-speed sync, indoor and outdoor shooting, and still and moving subjects. McNally goes by all the rules but also shows that some of them are meant to be bent or broken. This is evident in many shots, especially the finale at the dock that starts with nine Nikon speedlights and ends with a total of twelve. The DVD is much more informative compared with Nikon’s last lighting DVD The Speed of Light, which showed what the system was capable of but gave little in the way of how to use it. It does still have its moments where you feel like you are watching an infomercial, but these are very tasteful and should be expected considering the DVD is put out by Nikon. Some people may balk at the price tag ($39.99), but it’s reasonable considering the length of the feature (over two hours) and amount of information presented. Overall, A Hands-on Guide to Creative Lighting is an excellent guide to the Nikon CLS, as well as lighting in general. The DVD should appeal to just about all levels of photographers because it moves at a pace easy to follow for beginners, but also provides lots of useful tips and tricks for intermediate to advanced users. It even includes a handy cheat sheet with instructions for setting up all of the various CLS products, as well as some lighting terms mentioned throughout the DVD. Whether you’re new to Nikon’s speedlight system or have experience, A Hands-on Guide to Creative Lighting is definitely worth checking out. Images Courtesy of Nikon USA.